Officially licensed replica from The Hobbit series. This highly detailed replica from The Hobbit was constructed to match the actual filming prop exactly. 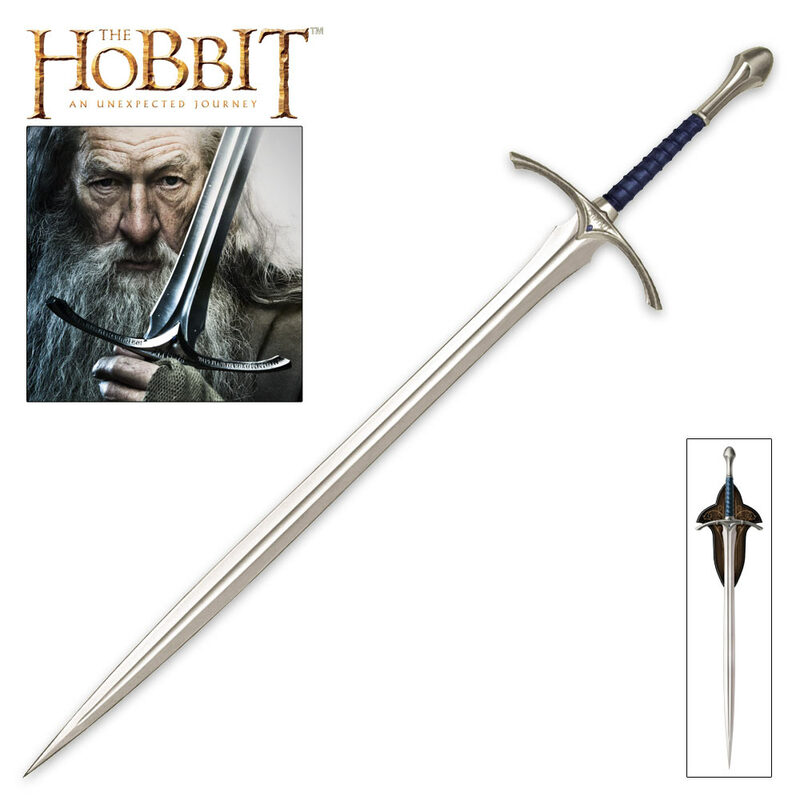 The 35-1/4" stainless steel blade features a blood groove and looks just like the one carried by Gandalf. 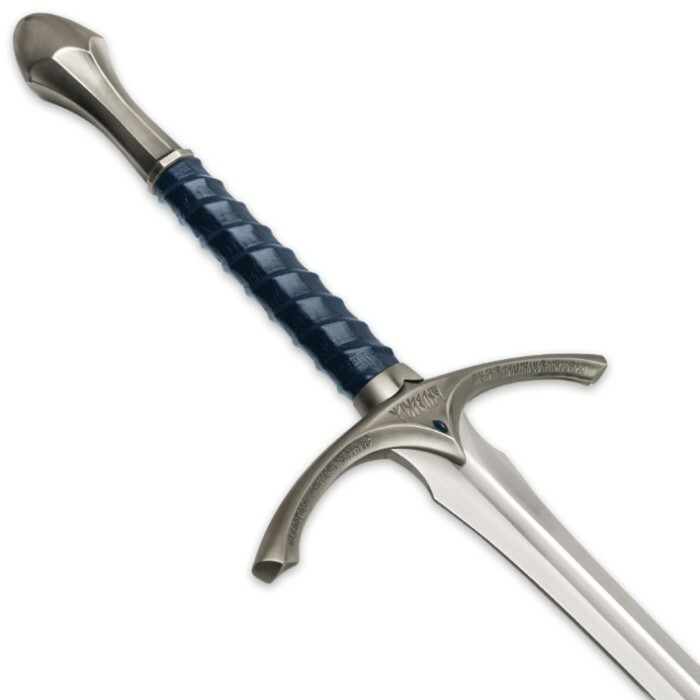 The hilt features solid metal fittings and hardware with an oversized guard and decorative pommel. The handle is wrapped in leather. It includes a wooden wall mount plaque to display this treasure. Includes certificate of authenticity. 47-5/8" overall. I’ve been wanting one of these for years and I finally bought one. It came in today and I have to say I love it. It looks incredible and feels like if it had an edge on it, it would be ready for battle. It also looks good hanging on the wall. I'll start with, I hope this review posts, I've noticed in the past if I don't put 5 stars here on Budk, the review seems to never get approved for others to see(theres always Amazon). That being said, the sword came dirty, with some scuffing on the blade, it cleaned up nicely. As one reviewer has stated, the pommel is out of alignment slightly. Not that you'd notice if you weren't looking for it, but once you've noticed, it kinda stands out, especially since I have a "pre-bankruptcy" United Cutlery Glamdring that doesn't have that problem. I will note that this version is also considerably lighter than the original 2002 Glamdrings, could be a change in materials? I don't know? I prefer this plaque to the LOTR version, its just nicer all around. All in all its a nice sword, just hit with what are constant QC issues from the factory which plagues BudK/UC Hobbit/LOTR items. Beautiful sword-It will shine in my collection of swords-Thanks BudK! Very nice sword, looks beautiful but came a little dirty. not a big deal though. also thought the pommel was crooked at first but I think that's how its supposed to be. any way a really great sword but of course just for looks, don't expect to chop a tree down with it. 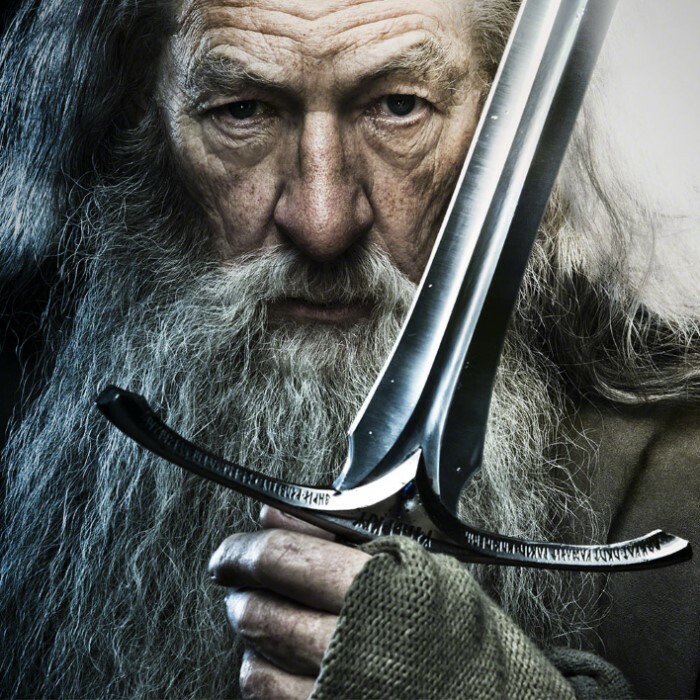 Gandalf is also my favorite character so I would love this sword even if it came broken in half. When It arrived and I opened the box I was pleasantly surprised by the fact that it was far better than it was described in the ad!! The picture doesn't do it justice cause it is far better than that and very sharp also!! I am very pleased to have added it to my collection of swords!! Thanks BudK for allowing me to gather this sword! !